The era of organic and printed electronics is emerging towards the realization of low cost ubiquitous applications of electronics. Organic semiconductor-based photovoltaics (OPVs) are also promising for developing low cost solar energy conversion technologies. Advances in the design, synthesis, processing, and tuning of the electronic structure and properties of conjugated polymer semiconductors are promising major improvements in the performance of organic electronic devices in these applications. Towards these ends our group is exploring a molecular and nanoscale engineering approaches to solution processable and robust, high charge carrier mobility p-type and n-type polymer semiconductors needed for developing the next generation high-performance organic electronic devices, including light-emitting diodes for displays and solid-state lighting, field-effect transistors, complementary logic circuits, and low-cost solar cells. 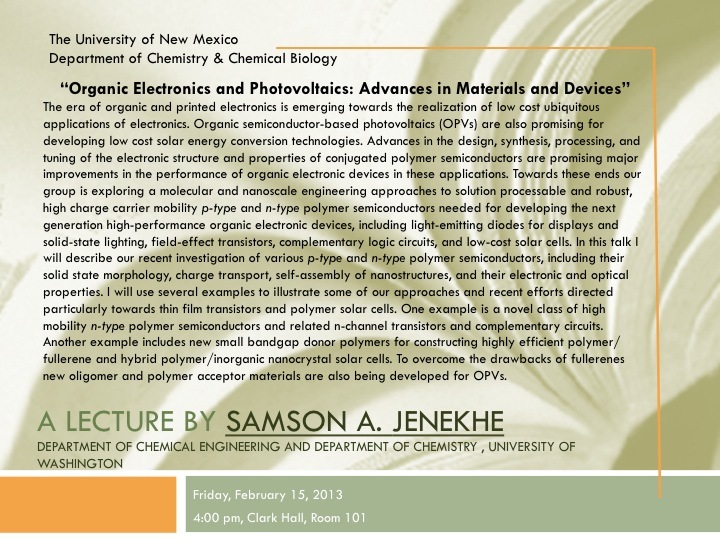 In this talk I will describe our recent investigation of various p-type and n-type polymer semiconductors, including their solid state morphology, charge transport, self-assembly of nanostructures, and their electronic and optical properties. I will use several examples to illustrate some of our approaches and recent efforts directed particularly towards thin film transistors and polymer solar cells. One example is a novel class of high mobility n-type polymer semiconductors and related n-channel transistors and complementary circuits. Another example includes new small bandgap donor polymers for constructing highly efficient polymer/fullerene and hybrid polymer/inorganic nanocrystal solar cells. To overcome the drawbacks of fullerenes new oligomer and polymer acceptor materials are also being developed for OPVs.